We have a sink in the PUP, but technically I had no idea where the water came from or where it went–or what the difference was when we camped with hookups versus dry camping. I wasn’t even sure what to do with waste water at the campground. After a little bit of research, I figured it all out, and it’s really not all that hard. If you’re just getting your first pop up camper, you may have some of the same questions I did. Now that we’ve found a system that works well for us, I thought I’d share how we collect and dispose of our gray water. Okay, so first off… what is gray water exactly? 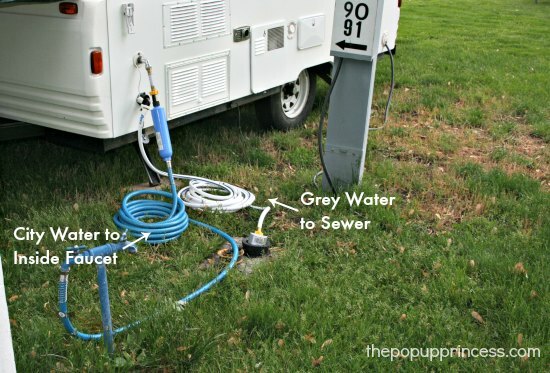 Well, gray water is the relatively clean waste water from your camper sinks and showers. It may contain stuff like soap, toothpaste, and food particles. I learned from our years of tent camping that most campgrounds don’t allow you to dump your gray water on the ground. 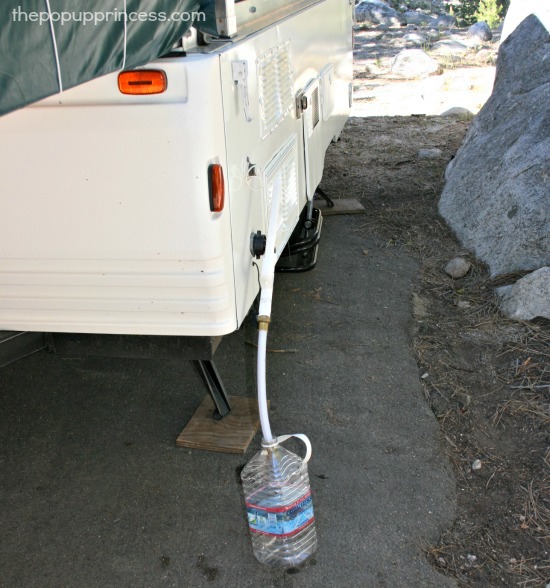 Actually, all of the campgrounds we’ve ever visited have had waste water regulations. It’s best to ask for the campground’s specific waste water rules beforehand. 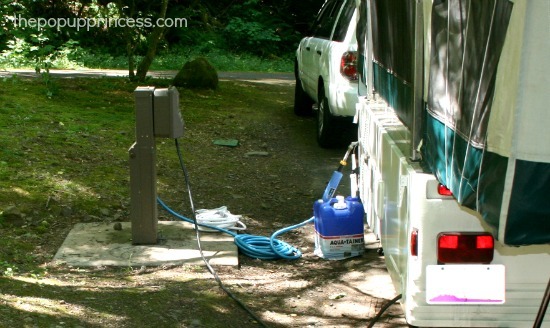 Some allow you to dump gray water in the campground toilets or comfort stations. Others make you haul it to the dump station. It’s one of the first questions we ask when we check in to the campground. Because we are using a hose for the sewer drain, we purchased a sewer fitting on Amazon so we wouldn’t get any leaks or odors while we were hooked up. It works like a dream, and I love it when we have full hookups. When we are camping in some more remote areas, though, full hookups are never an option. In those instances, we rely on a tank of some sort to collect our gray water. You don’t really have to do anything fancy for a gray water tank. In fact, on our most recent trip, we arrived at our first campsite to realize we’d forgotten our usual gray water tank. A gallon sized water bottle worked fine, although, we had to empty it quite a bit. We hit the store before our next stop and picked up a 7-gallon Aquatainer, which held a little bit more gray water. These are available at Wal-Mart and many sporting goods stores, but you can also pick one up on Amazon. Many people use these for their normal gray water tanks, which is perfectly fine. I feel like it fills up a little too quickly for us when we are camping, and I prefer to go as long as possible before I make the trip to the dump station. It’s also pretty heavy and awkward to carry once it is full. This is our usual gray water tank. 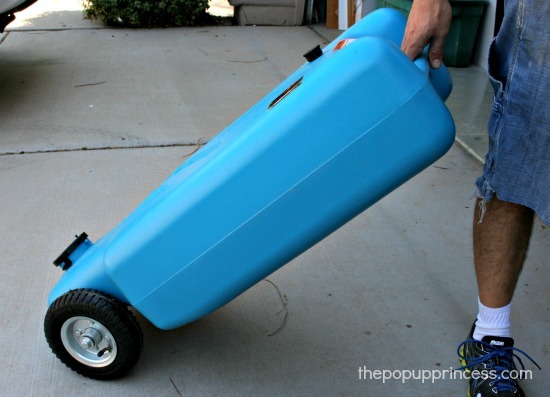 We love using this 15- gallon Barker Tote Tank to collect our sink water. We bought it on Amazon, but I’ve also seen them at Camping World. It is a little pricey, but for us it is worth every penny. It holds much more than the Aquatainer, and it has wheels, so we can roll it to the gray water disposal area. It also has a hitch attachment, so we can hook it up to our vehicle and tow it to the dump station. 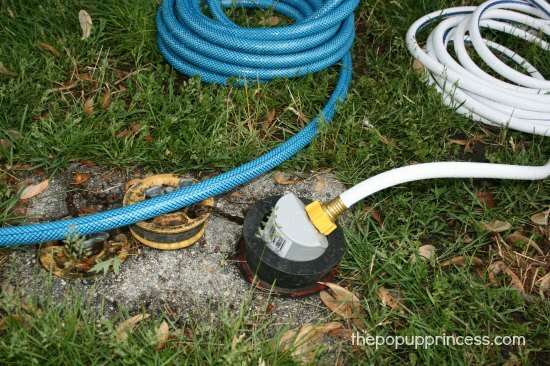 A short length of garden hose runs from the drain connector to the tote tank. 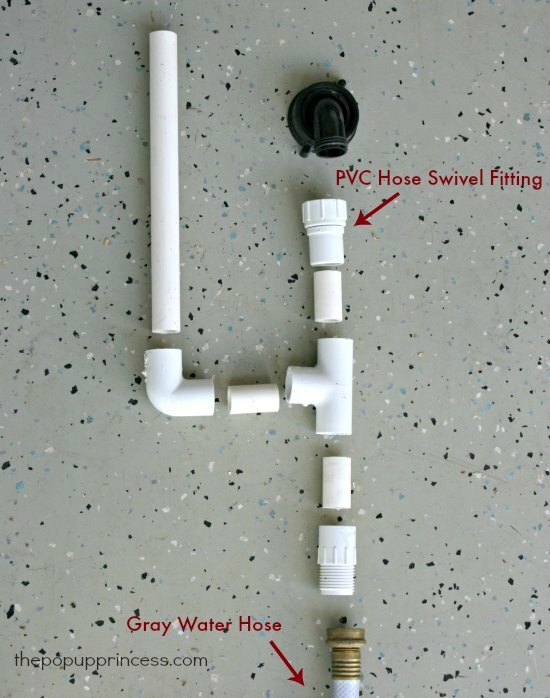 Recently, Mr. TypeTwoFun used some PVC pipe and fittings to construct a little vent so the sink would drain faster. We never really had a huge problem with the sink backing up to begin with, but I have noticed that this little mod does help things drain faster. It’s a really simple mod and worth the 15 minutes it took to put together. The parts are all things you can find in the plumbing section of your hardware store, but make sure the top fitting is a hose swivel fitting. The longest piece of PVC pipe is the actual vent. Ours is about 12″ tall because I didn’t want to find space to store anything longer, but technically, you’d like to have your vent higher than your sink drain–just in case you do have the sink back up. You’ll have water coming out the vent otherwise. Again, we have never had any issues with the sink backing up, so it’s never been a big deal for us. 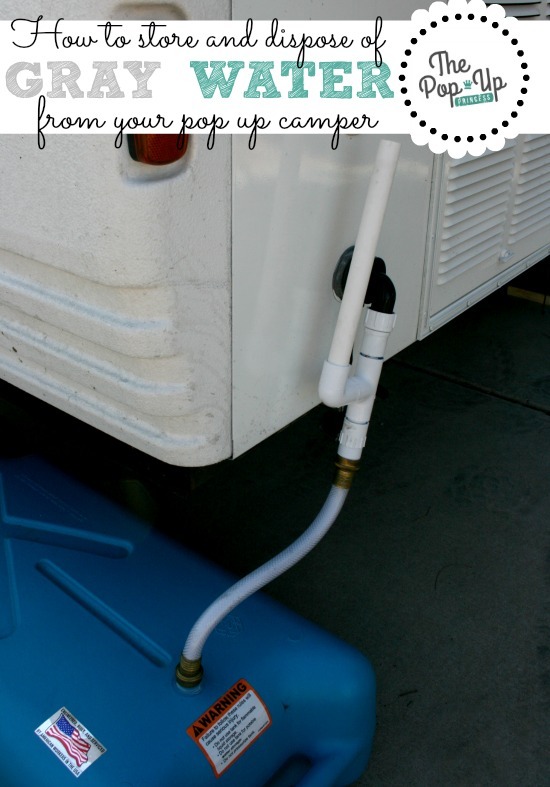 We use the drain connector and garden hose method to drain our gray water because they are easy, versatile, and take up very little room in the camper. You don’t have to use that method, though. If you find that your sink is draining too slow for your liking, you may want to adopt a system that uses larger PVC pipe or flexible hose to drain the gray water. If you’re interested, there are some great ideas on the Pop Up Portal forums you could check out. 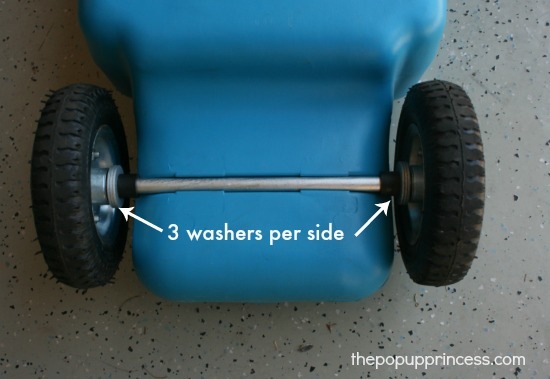 When we first got our tote tank, it had hard plastic wheels on it. While there is nothing really wrong with the plastic wheels, they made SO much noise when we would drag the tote to the disposal area. 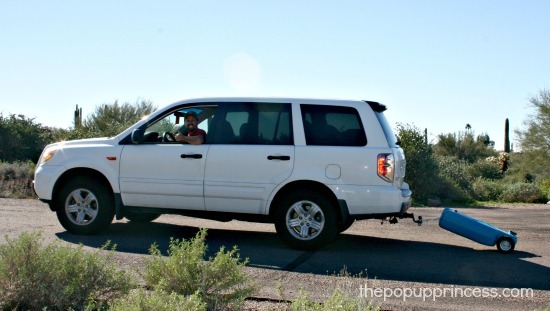 When we towed it behind the car, people would come out of their campsites and up to the road to see what was going on. It was more than a little embarrassing. 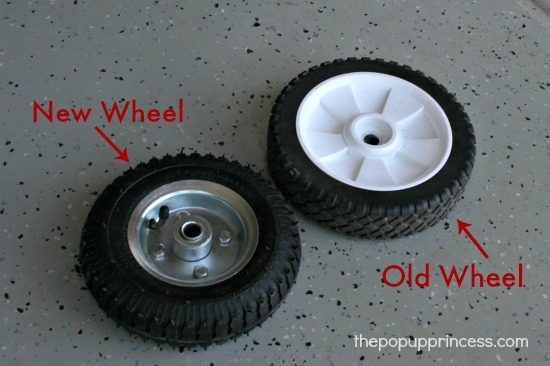 🙁 Mr. TypeTwoFun decided to replace the plastic wheels with 8″ pneumatic tires. You can find them at home improvement stores and such or on Amazon, but we found ours for cheap at Harbor Freight. Mr. TypeTwoFun just popped the axle nut off one end and removed the axle. 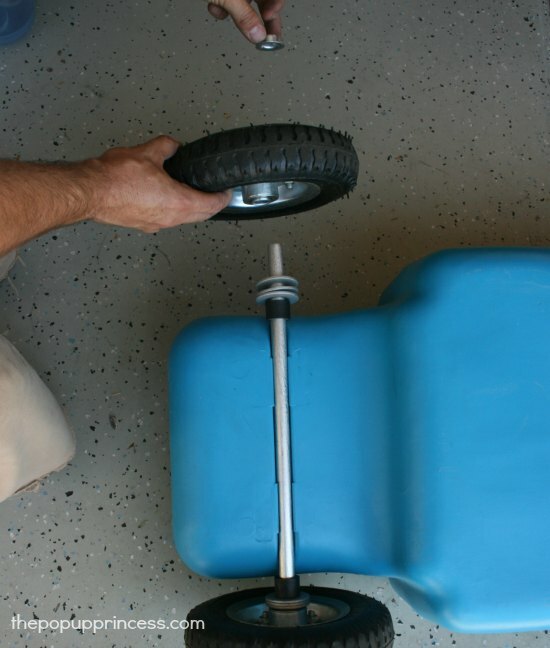 Then he replaced the tote tank tires with the pneumatic ones. To keep the new tires from rubbing on the tank, he added a few washers with an inner diameter of 5/8″. 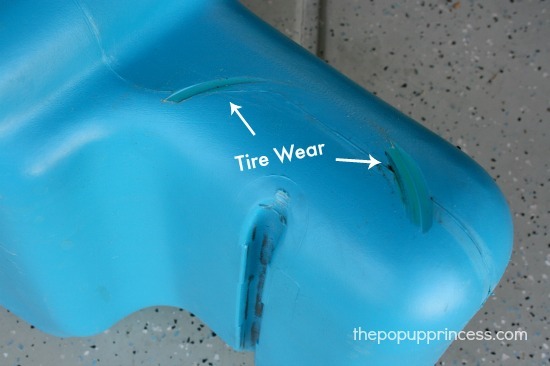 We didn’t do that when we first replaced the tires, and had some pretty severe wear on the tank after a few months. Once we added the washers, everything was much better. Thread your tire, 3 washers, and the black spacer (this came on the axle originally) onto the axle and insert it into the channel in the bottom of the tank. Then thread the black spacer, three washers, and pneumatic tire on the other end. 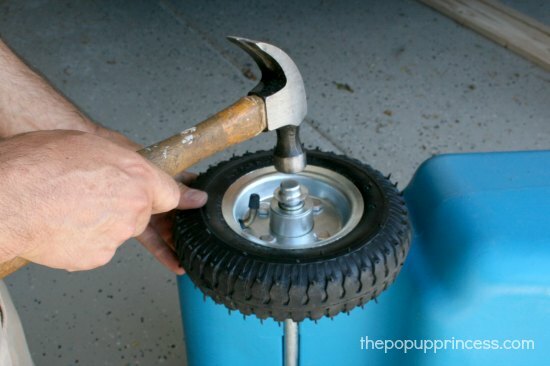 Gently tap the axle nut in place with a hammer. You may have issues with the original axle being too short to accommodate all the new components. We did. If that happens, you can purchase a new piece of 5/8″ diameter metal rod and cut it to size with a hacksaw or wheel grinder. We purchased ours at Home Depot for around $8. Mr. TypeTwoFun cut it about 3/4″ longer than the original axle, and it solved the problem. Once the axle nut is in place, check to make sure your tires aren’t rubbing on the sides of your tank, and you’re good to go. If you want to run a bead of plastic epoxy down the channel before you insert the axle, it will make things more secure. It isn’t necessary, though. When your tank is full, you can drag it to the disposal area easily. The large black cap on the tank hooks to a flexible sewer hose, which is included with the tank. You can just attach the hose, insert the end into the designated disposal area, and tip the tote forward to empty the tank. Easy peasy! Keep in mind that every pop up camper is different, so your system may not be just like mine. You might have a completely different way of doing things. My way isn’t the only way–it’s just what works best for us. If you’ve got a different way to deal with your PUP’s gray water, I’d love to hear it. Feel free to share it in the comments section or on our Facebook page. Yep! Each campground is different, so check with the rangers to find out how to dispose of your gray water at that particular campground. What is your inside water system? Is there a water pump installed or do you hand pump? The previous owners of our popup took out all the plumbing, so we are starting from scratch! Wow! That sounds like a project! We have a water pump and hot water heater, and I love it. I can’t imagine ever taking it out. Do you still have a water tank? No water tank! We are starting with a sink with a hole (no drain)! We purchased a portable tote for gray & black water use but can’t figure where we can store it away while traveling on the road. 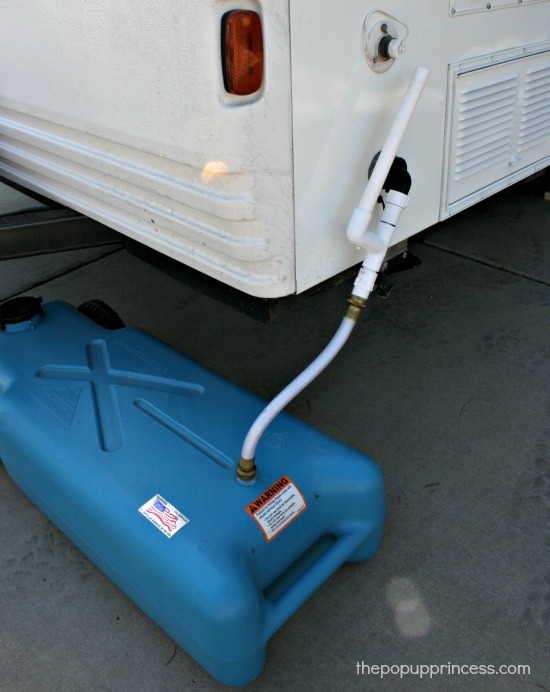 Since it will be used for black water, keeping it inside the camper is not acceptable nor in the back of the car. The rear of camper has the spare tire centered over bumper so no room there. Battery and propane sets on front tongue area so no room there either. Thought of setting up some kind of bike rake on rear bumper in front of spare tire. Any suggestions? I am adding/welding a tow-receiver to the back of my camper (with the frame welded supports). This will allow me to add a little platform to the back of my camper for a generator and a cooler. This might be an option for black water. It’s a process, and might be expensive (if you don’t have a buddy who welds or a tow-platform). I bought the receiver-tube at Harbor Freight for <$20. I found an example of a receiver addition online. Just wanted to say thank you for sharing and all the great info. 2 questions about your gray water system. 1) have you found a way to determine when your gray water tank is full? 2) with your shower and sink – does it empty to one exit or do you have a gray water exit for both? If 2 exits did you do 2 tanks or combine them to 1 exit then to your gray tank? Most tent trailers are not self contained – Some of the High Wall models are. For ours (2001 Starcraft), there is a drain directly under the shower and behind the sink. We made the mistake of not trying out everything at home first before trying to use the shower on a trip. LOL. How did you husband get that axle nut off the Tote? I was banging on mine for like 30min with no luck. Now re reading this i think i might try taking the entire axle off and replacing it with a rod from HD. Hopefully that will hammer out easier. Thanks for the info! Thanks for writing back! I am slowly moving on it, I think I am going to just do a whole new axle setup with new nuts. Thanks! Ok that helps a lot. I’ll check out the irrigation piping parts. I’ve been stalking your site for a few weeks now,lol. My wife and I just bought our first pop up. It’s a 98 Dutchmen. It was already in pretty good shape, but we plan on making updates as we go along. I’ve already washed it with the erasers, waxed it with the Protect All, and figured out the cassette toilet, thanks to your site! My question is what is the hitch adapter that you use with your 15 gallon tank? Our camper came with one of those tanks and I would much rather tow it than load it in my Jeep. Thanks for taking the time to put all this information up! Do you have instructions/pics of how to mount the gray water tank under the pop up so you don’t have to store it inside. Why not store it on top when the pop up is closed? And open you need it off to use. Thank you for all the Great tips and idea’s ! We are new to pop up camping and look forward to reading all the articles. Our 95 Coleman needs some work to be sure…..! Thanks again ! So glad I stumbled across this article! My husband and I were just discussing what we can do differently with our gray water system. Currently we just have a short garden hose running into a 5 gallon bucket with a lid but it fills up so fast! I never thought about draining into the sewer if full hookups are available, but we might have to check out that tank too! Love your website and all of your great info! We love our pup we bought last summer and are planning a trip to the black hills in June! Can you tell me where the water comes in and where it goes out? Im new to the pop up world. I have a 2000 rovckwood. 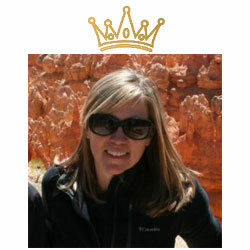 Love your site and getting schooled by the pop up princess! Where exactly did you get the black elbow piece that connects to the actual trailer drain? OMG, THANK YOU!!! I’m not so anxious about setting this stuff up now. Newbie, just gave up tents as I need A/C & a real kitchen!! Popup Princess is a life saver! I have a 3 year old popup, bought brand new. I never knew what to do. I got a manual that doesn’t help and professionals that think I can figure it out. I wondered why people would stare at my popup when grey water was running out the side. The dealer said it was legal so I didn’t do anything. Thank you for your blog! The Grey Water Vent looks like a great solution to slow drains! What size PVC do you use? It looks like some of the parts (hose adapter) are somewhat hard to find (special order at home depot). Do you have suggestions on where to find the part? We didn’t have any problem finding the parts at our local Home Depot. It is all standard 3/4″ PVC pipe. Just out of curiosity, where do you transport yours? Inside the camper? Thanks for this. Even used your link to buy the few things on amazon you recommended. Very useful and detailed.